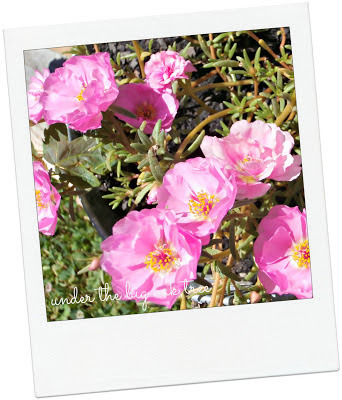 Under the Big Oak Tree: Gardening Journal ~ My Container Garden ~ Loving the Colorful Blooms! Gardening Journal ~ My Container Garden ~ Loving the Colorful Blooms! My family is full of gardeners. So many of my relatives have beautiful gardens, full of bright, vibrant flowers and lush green plants. I, apparently, haven't inherited the green thumb gene like the rest of them! Sure, I love the idea of having the beautiful curb appeal that a garden can bring to a home. I just don't know how to go about it. Plus, living on a single income, there's not always money left in the budget for flowers and plants. Without a landscaping design in mind again this summer, I decided to add some color to our yard by starting a small container garden. I grabbed some assorted planters from the shed, garage, basement...even my kitchen cabinets...and started filling them with plants we purchased on sale at the hardware store. Having a gift card for the hardware store was a big help! In all honesty, the plants almost didn't make out of their original containers. After coming home from the store with our pretty plants, it was terribly hot. I decided we would plant them the following day. After that, one thing happened after another and it took a while before I even thought about them again. When I finally got them into the planters and buckets that I collected from around the house, I wasn't convinced that any of them were going to make it. Imagine my surprise when I looked out the window and saw the pretty colors blooming in my container garden! Grace chose this pretty, pink portulaca. so at first, I wasn't really thrilled with her selection. I'm pleased with her selection! 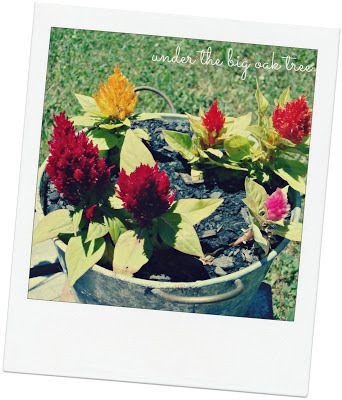 Celosia is one of my favorites! I just love the vibrant colors! I just couldn't resist bringing them home! In my excited state, I only snapped a couple of photos of the blooming plants and completely ignored our pots of mint, rosemary and basil. I guess I'll have to photograph them for another blog post!